Today Jason and I went to my favorite Japanese Market and we got all kinds of goodies. We had a simple asian dinner with boiled edamame pods, miso soup with nori, brown rice to go into the soup, and kimchi. It was really good but I was still in the mood for asian food. 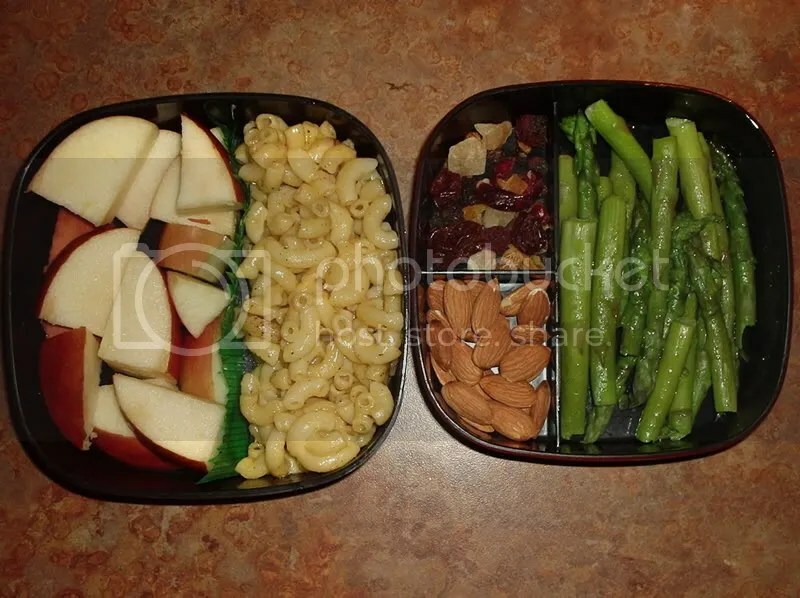 So I came up with these bentos for Jason and I tomorrow. Unfortunately we won’t be able to have lunch together tomorrow, but at least we’ll both have similar meals! I made some carrot and avocado sushi and put a little container of soy sauce for Jason. I filled up a container for myself, plus filled a little hello kitty bowl with pickled ginger and wasabi. 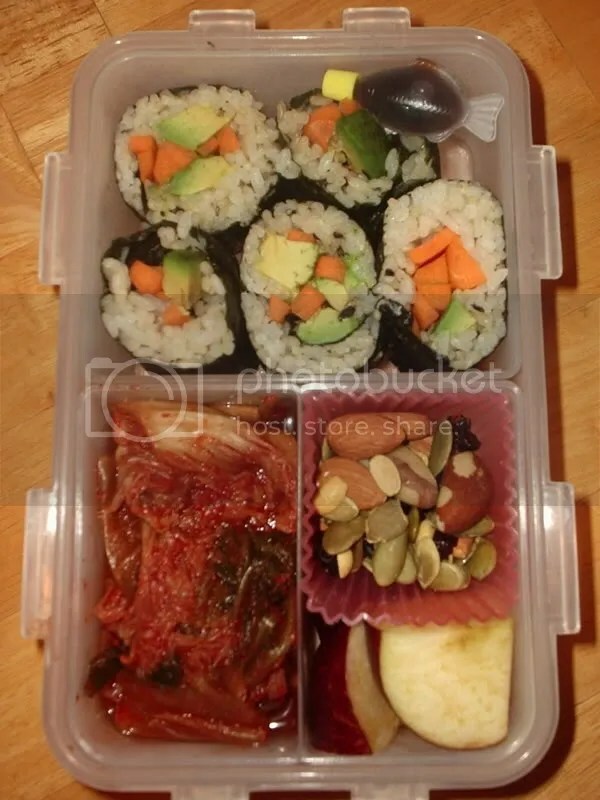 Then I added some kimchi to his,and apple pieces and mixed nuts to both. 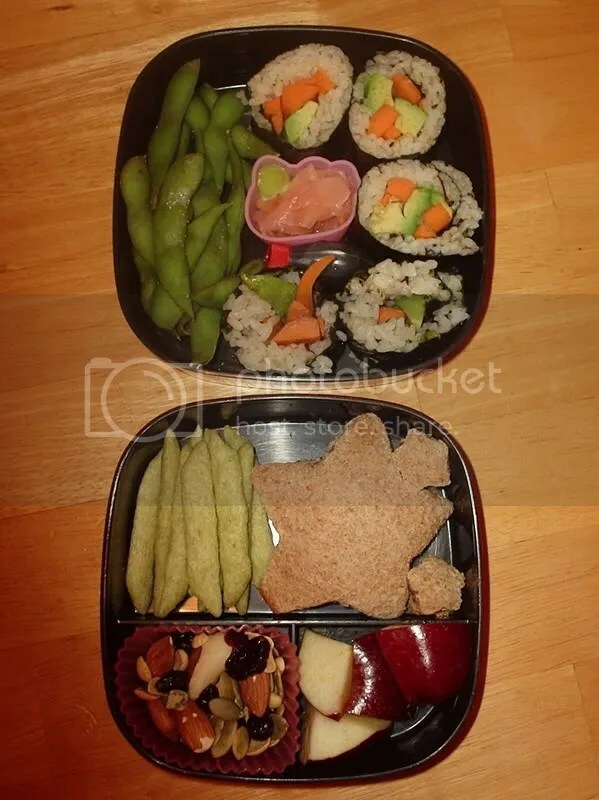 Because my bento box has so much space it took me a while to fill up all the spaces. Our kitchen is a little bare, so it was hard coming up with things that would go together but I think it works out well. And mine. I added some snack peas, star shaped peanut butter with sugar free jelly, and edamame. Last night for dinner, we had some spaghetti with garlic bread. Since I haven’t had spaghetti in a while, I thought it would be nice for my lunch too. 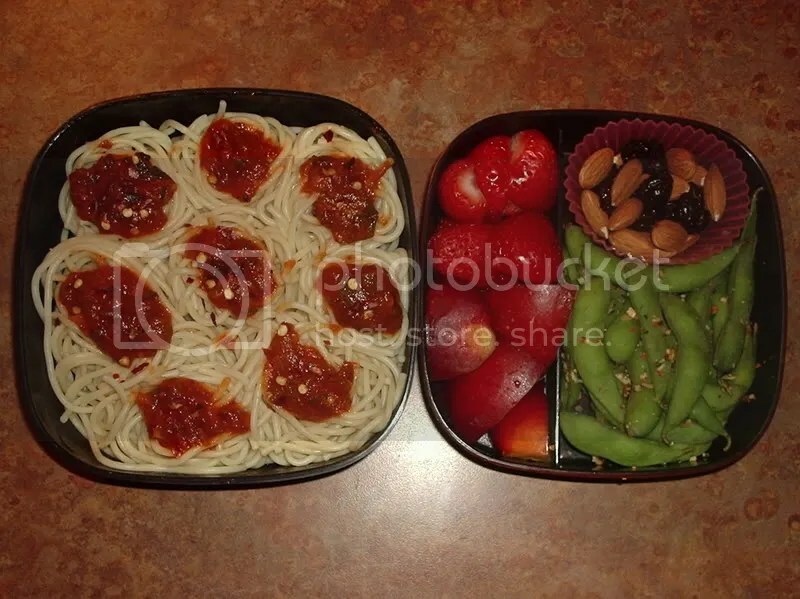 After thinking about which bento box would be best, I choose my “authentic” style bento and fashioned the noodles and sauce into little nests. For the 2nd tier in the box, I cooked the rest of my edamame and sprinkled some Mrs. Dash on it. Then put some sliced strawberries, nectarine, and some almonds w/ dried cherries. I did a lot of snacking yesterday, so when dinner came I didn’t eat very much. When I started packing my bento, I thought it would be nice to be able to have some of the good food my Mom made for our dinner. 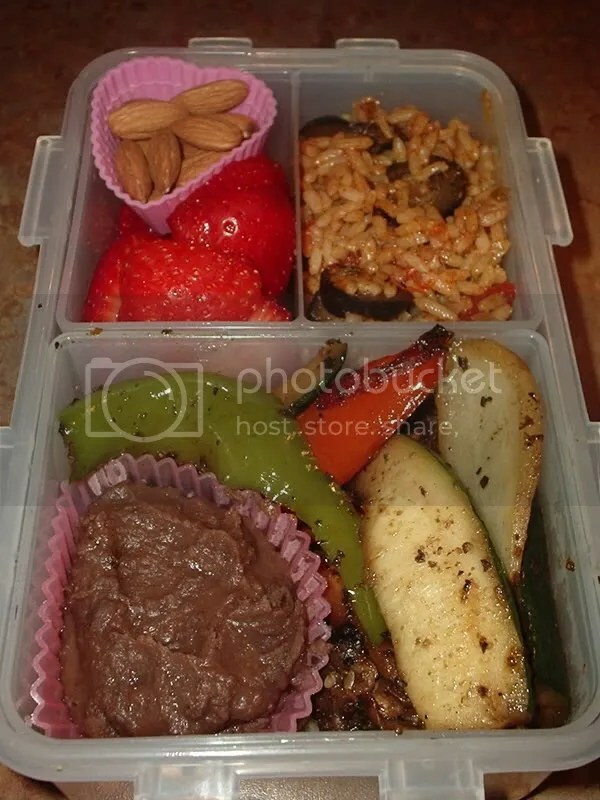 So I placed some of the Spanish rice, black beans, and grilled veggies in my Lock & Lock and then sliced up some strawberries and added some almonds. This bento was very good! I have a long day at work today, so I made myself a pretty big bento for lunch. I made it in the theme of the sea, with octopus smart dogs and a little apple fishy. Sadly the fish is hard to make out in the picture. 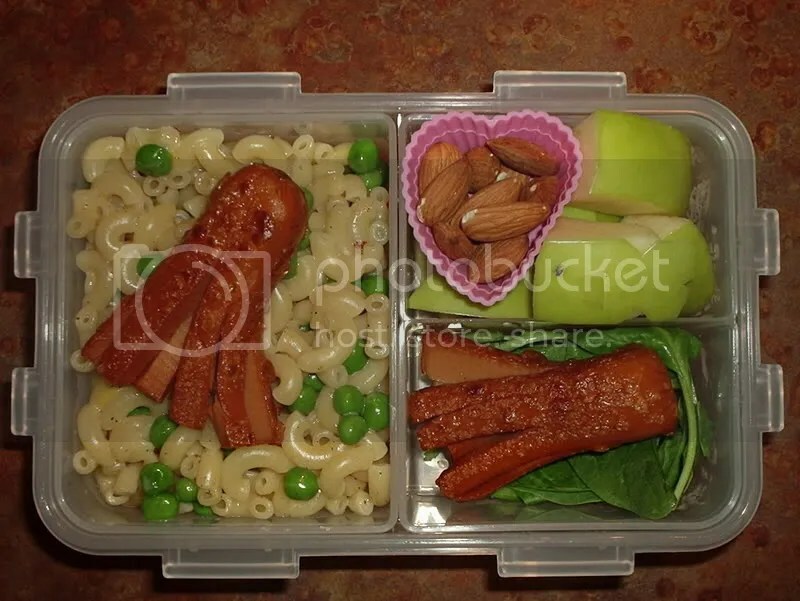 It has vegan mac & cheese with peas, raw spinach, 2 mini octodogs, green apple, and some almonds. This morning I remembered I still have some edamame in the freezer, so I cooked some of that up and added it with the spinach for an extra snack (so it’s not pictured). I have already eaten most of this bento and it was really good. I’m really liking my new Lock & Lock bento too because it’s easy to take part of it out to heat up with is very convenient. I had my 21st birthday this weekend, so I didn’t have time to make any bentos, but today I needed one for lunch. I used some leftovers from last night (as usual) and made a fruit salad to go with it. I also found some Smart Dogs hiding in the freezer, so I thawed those out and fried one up. Then I cut it into a little octopus (quadpus?). 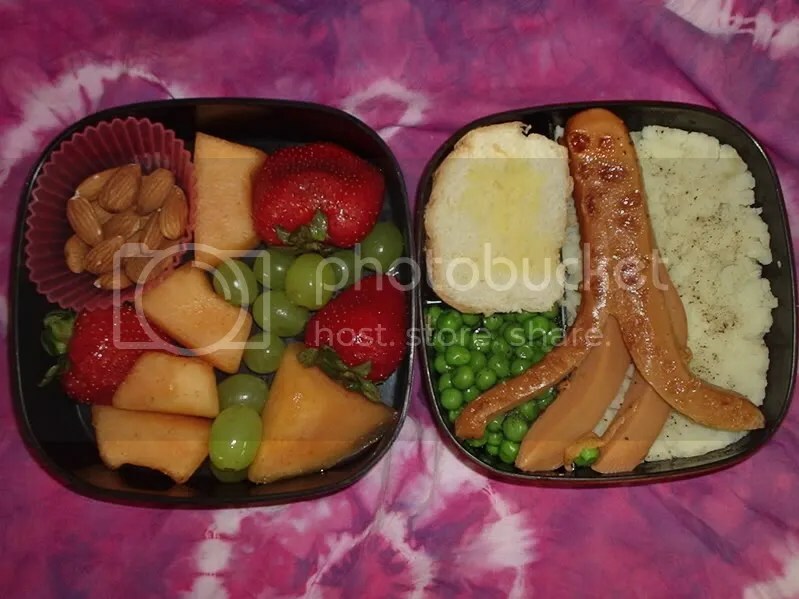 I think the fried part looks like the texture of an octopus too. On the right there’s mashed potatoes, peas, garlic bread and a smart dog. On the left there’s a fruit salad with grapes, cantaloupe, and strawberries. There’s also a little container with raw almonds. I used leftovers again for this bento. We had leftover vegan mac n cheese and asparagus so I added that in. I cut up some apple and put some raw almonds and dried fruit in there to accompany it. After I put everything in I realized it probably would have worked out better if I put the mac and cheese and the asparagus together and the apple with the almonds/fruit, but I didn’t want too much asparagus so I guess it worked out fine.